You helped us keep the neighborhood's dream of milkweed alive and growing. The early milkweed planters put in the dirt-churning tasks of scraping away kudzu and brambles to find a home for humble weeds. Humble weeds that feed birds and bees! Without Milkweed, no monarch butterfly families can take wing. It's a critical host plant. Milkweed populations around the country are in decline. This will help restore the meadow and the butterflies. Your work on May 16th outlined the trails to enjoy the meadow, and roped off the 915 square foot garden plot for concentrated attention to pollinator habitat. The White House is pushing the idea to improve honeybee homes, too. read here. As we work every Monday morning through the summer until the end of the growing season in October, we will train and entertain enthusiastic volunteers. Our jobs will begin with appreciating what is before us: open public space, with trees to nurture, undergrowth to control, birds to identify and a creek to enjoy. The Home Depot Buckhead is killing us with generosity. Four (count em!) Four! Pallets of bright mulch will curve the trail at the Meadow around the edge to the Milkweed Meadow made ready for Monarchs by the crowd above. Hooray for every lovin' bag totin' volunteer who put the M In Mulch! And yea for Home Depot's Orange Trail taking us all back into the Meadow. Thanks Jasyn, Earl, Deshawn, Matt, Marisol and Mike. We loved the red buds you planted at the trailhead circle, and the rope line around the milkweed. We'll see you again on second Mondays, through the growing season! Reading this on Monday morning? Paul & Tiffany gave thumbs ups to the Saturday trail mulching with Tucker and Oscar on their leashes. Glad to get another Lindridge neighbor approval. Volunteers are working right now to keep and maintain the trails along the creek. Each Monday in the months from now through the growing season, volunteers from across Atlanta are helping us build the Meadow Loop trail, maintain the Cheshire Farm trail and support the years' long efforts of Bob Scott and Wayne Owen on the Cedar Chase and Confluence trails. The new commitment from neighbors and trail supporters means you can count on seeing progress all summer. And you can join us. Just pick a Monday morning, and send an email to Sally@southforkconservancy.org. South Fork Friends at WABE gave us a wonderful boost on A Closer Look, the popular noon show with Dennis O'Hayer and Rose Scott. cough cough who looked a lot like Jim Burris when I was on the air. They knew where the creek is, and how precious it is to the people who are finding it. DeKalb County Super Commissioner Kathie Gannon brought friends, enthusiasm and bug spray for a June trip walking all the developed trails. She liked the new Zonolite Park and approved of the distinctive trail signs. DeKalb County's Parks & Recreation Department's Dave Butler is making real the dream of a community garden on the once-contaminated county land. More pictures on her Facebook page, linked here. Posted on July 3, 2015 by Kimberly Estep. Meet the white tuburculed crayfish, a popular native. How many kinds of crayfish live in the creek? Nobody seems to know for sure. The numbers will help measure the health of the watershed. So Tamara Johnson, an Atlanta-born scientist with the US Fish and Wildlife Service, is planning a multi-year project to find how many of what species, better known as mudbugs or crawdads, are really at Home On the Creek. US Fish & Wildlife's Tamara Johnson, right, and students from metro Atlanta colleges explore best sites to survey native crawfish populations in the South Fork. Tom Tomaka and Diane Ryu took science to the third graders at Morningside Elementary School on May 6 during EarthWeek. Where does the playground water flow? Into the South Fork, these students learned. Here's a nice thanks from Beth, the mom who organized it. Thank you so much (and to your colleagues!) for your wonderful engagement with our MES third graders today! I was delighted to see the kids' interest and curiosity (I heard one boy say to his teacher, 'this is so cool!') and we really appreciate your willingness to share your time and your knowledge with them. Hopefully they left school today with a bit more awareness of the importance and function of their own local watershed, and maybe we even encouraged a future scientist! Thanks again for your time and enthusiasm! Look at that short clean grass emerging along the new Cheshire Farm Trail. Notice absence of Kudzu on fancy fence? This is Atlanta Parks Dept. doing. Thanks Doug Voss, Tucker Hutmacher and friends at City Hall. Thanks, Heather Gartner, Laura Page, Leo Keber and Shreyansh Chandra. Four Zonolite grownups who normally design containment bio-labs and hospitals for the business named WSP, formerly Smith Carter took a green break, trimmed up the trails behind their studio at Zonolite. When you see them on the better groomed trails, thank them for keeping the trail clear and the bio-genie in the bottle. Who is taking the Dog Gone Notes? Or, Did the Dog Eat your Homework Again? Rich Sussman tells a class of UGA Environment and Design students what it took to build the Cedar Chase and Confluence Trails. Professor Stephen Ramos, in white beret, brought the class to see how neighbors built backyard conservation and access to greenspace projects. Five Percent Day for South Fork at Whole Foods? You Bet! What a Whole Foods Fine Time! South Fork's Diane Ryu, left, and board member Ruthie Taylor Norton greeted hundreds of Whole Foods shoppers with news of the new trails close to the community. Barb Tucker, left, and Martha Porter Hall, laughing, share maps and trail guides with a Whole Foods mom and two children ready for a nature walk. Dorothy Sussman knows her way around the Love Your Block grant world. But she wondered if new oversight of Love Your Block by the Community Foundation may not appreciate her latest butterfly project. She didn't need to worry. She and her Lindridge Martin Manor Committee sought... and won! A thousand dollar grant to install milkweed, the host plant required to restore Monarch Butterflies to Atlanta. The neighbors are matching every penny with donated labor and South Fork's loan of Tool Bank Tools. Bring on the Butterflies! Jack Funderburk chomps down on kudzu roots making way for milkweed. How many mattocks does it take to move mulch for milkweed? Many Many Many. Whole Foods Briarcliff green team volunteers learned of our projects & wanted to help plant American chestnut trees along the Confluence Trail. Left to right, Charity Francis, Paris Cole and Mark Lawrence. We're editing new panels for sign posts for the Confluence Trails. Rules signs can encourage or dismay trail users. The best language and pictures mean good times on public trails. Paige Singer, DeKalb County Parks Project Manager personally fitted the new panel to the Zonolite trailhead. Girl Scouts put up cookie money to support the South Fork's Trail work. Atlanta Girl Scouts shared their cookie money to support our trails along the creek. $200! That is a lot of thin mints. Thanks to Judy Adler and her daughter's troop at Garden Hills Elementary School. Posted on May 18, 2015 by Kimberly Estep. The South Fork Conservancy needs help with an ambitious plan to link intown Peachtree Creek tributaries to Emory University via low-impact trails. Three separate trails are nearing completion, and a plan to connect them at the headwaters of Peachtree Creek near Buckhead and the BeltLine is underway. "We are calling our next phase The Confluence Trails, at the headwaters of Peachtree Creek beneath I-85 and Georgia 400 near Lindbergh Drive," explains South Fork Board Chair Bob Kerr. "Now we need a confluence of supporters to make the Confluence Trail a reality. The South Fork's success in our first five years showed us the demand for more connected low impact trails. We need to add staff to make our vision of connecting people to the creeks come true," Kerr said. "Our founding Executive Director Sally Sears wants to return to the board to raise the funds to complete this important project. We need to hire her successor with experience in non-profits and building projects." South Fork Board member Anthony Powers with Intown Ace Hardware on Scott Boulevard is leading the board's search committee. Successful trail building and creek restoration includes the 12 acre DeKalb County Zonolite Park, near Briarcliff Road, and the half mile Cheshire Farm Trail between Cheshire Bridge Road and Lindbergh Drive. These projects required comprehensive partnerships with federal, state and local governments, plus Trees Atlanta, Park Pride, the Kendeda Fund, the Million Mile Greenway and US Fish and Wildlife Foundation. The Cheshire Farm Trail cost a million dollars from Georgia Road and Toll Authority funds, and partnerships with the Lindridge Martin Manor Neighborhood Association and the Lindbergh LaVista Corridor Coalition. For more information, and maps and directions to the new trails, go to the website at www.SouthForkConservancy.org. Inquiries may be sent to sally@southforkconservancy.org. Posted on May 4, 2015 by Kimberly Estep. The Creek Rising Party introduced new friends to the trails and meadows. It's PARTY time! Spring means the Creek is Rising. Our annual friend and fund-raiser is Thursday, April 16, from 5-8 p.m. at Zonolite Park. Find beauty on the banks at Creek Rising Party. Perhaps a mushroom quiche? Or a sip of Bog Water? Tickets are limited, so reserve yours now. Click Here for a fast purchase. Party chair Debra Edelson is promising Klezmer Cajun music as we explore the creek trails with food, drink and fun. US Fish and Wildlife scientist Kevin Lowry inspects the new posts with South Fork Board Chair Bob Kerr, right. DeKalb County's Parks and Rec crews used skill and muscle to build new trail signposts at Zonolite Park in late March. 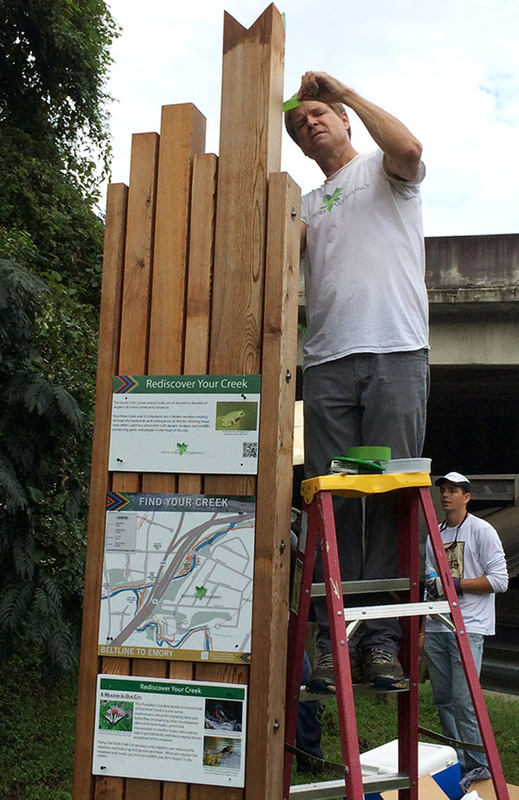 Sign panels coming soon will hold maps, information about the creek and remind trail users of the contaminated dirt removed from the floodplain to restore these creekside 12 acres. The unique sign posts feature a colorful chevron on cedar wood; long-lasting, and reminiscent of centuries of Indian life here. They have gaps between the cedar, allowing visitors to see through the posts to others approaching. Honoring the Earth at Emory began March 31 with a foodie fest and a scavenger hunt. South Fork's Diane Ryu set maps and stories in front of thousands of students changing classes... and perhaps changing the earth! South Fork's not just nature, you know. Last year, as a founding exhibitor for the Atlanta Science Festival, we gave tours of the creek to dozens of unbelieving Atlantans. They barely knew the creeks and all this ecology was even here. This second year of support for the Atlanta Science Festival brought volunteer Science Festival enthusiasts to join Tom Tomaka, in plaid on the right, replanting and inspecting our native chestnut orchard. Ashton Edmeades enlisted Robert Weimar left, Zode Compton on the ground and Alex Langan, right. When you next walk the Confluence trails, look for the ten new bird houses hiding along the creek. Ashton says "All ten birdhouses were constructed from long lasting Cypress wood that will age to a silvery grey over time. After consulting on appropriate birdhouses for the area with Ms. Joy Carter, President of the Atlanta Audubon Society, we built and installed five Bluebird Houses and five Wren Houses. These houses accommodate Bluebirds, Carolina and House Wrens, Chickadees, and Tufted Titmice." For more, click here! How can we make our creek banks grow? We can trust Home Depot's garden guru Marty Harris, with Eileen Clarr, to come up with great ideas for plants for perilous places. They invited South Fork's Martha Hall and Dorothy Sussman to promote trails at the Lindbergh Home Depot Garden Kickoff day March 21. About a million people saw our maps & promised help. Posted on April 6, 2015 by Kimberly Estep. DeKalb County is readying to build a connection from one side of the South Fork of Peachtree Creek to the other near Clairmont Road. Just don't call the connection a bridge. It will be stepping stones. This week Facilities Project Manager Bob Sims reported the long-wanted crossing linking neighbors on the Superior Avenue side of the creek to the library and tennis center beyond the old Waterworks on the other side will be sent out for construction bids in March. Valerie Boss, leading the effort to add native plants and people to the Ira B. Melton park, broke the good news to the Medlock Area Neighborhood Association meeting Friday Feb. 14. The group pushed the county for low-impact trails and a creek crossing to link hundreds of neighbors to Mason Mill Park. The master plan on DeKalb's website shows how it connects to the dog park and comfort facilities. How will this kind of crossing work? Stones arranged as DeKalb plans won't block the normal flow of water, and in flood, the steps will be underwater. Plans call for 14 3.5 to 4 foot boulders set in the creek bed, rising 6 inches above average water elevation. Gaps between the stones will be no more than 1.5 to 2 feet. Stairs on either bank will let creek lovers get to the stones without eroding the bank. Sims' email confirmed the stream crossing re-design is complete, and permitting approval anticipated within two weeks. I gave Marianne Skeen a ride home from trail building in Zonolite Park to her house on Superior Avenue near North Decatur Road. She stretched her limber fingers and wondered out loud "What would it be like to be able to walk to the library without having to get on Clairmont Road? We would have to get through the privet thicket and across the creek somehow. But it could be gorgeous." That conversation was five years ago. Today the adventurous Marianne is back from navigating the Irrawaddy River in Myanmar, and reflecting on the success of her wish. First she invited Conservancy volunteers to tame some of the privet in Ira B. Melton park. We partnered with the neighborhood associations, led by Valerie Boss and heavy Boy Scout involvement. Dozens of work days pruned the maze of trails to an easy to follow loop. Now a native plant entrance welcomes walkers and dogs, off road bikers and children. And finally, DeKalb County's creek crossing, on stepping stones, is promised to be "significantly complete" within the year. What else can Marianne Skeen ask for? We're all ears! We think a trailhead sign and a high-quality well designed trail head is next on her list. Sage Hill Kroger's gone and done it again! They provided water, bananas, chips, and granola bars for our MLK volunteer day and fueled SIXTY wonderful volunteers as they restored the Meadow trail. Thanks Manager Bert Bohannan! How many volunteers does it take to yank a meadow's worth of invading vines? The MLK Holiday found some 70 people from middle school ages on up tossing vines to return the Meadow Loop to its open habitat. Emory physics professor Jed Brody tends a sturdy new tree. Late on MLK afternoon, somebody snatched three trees from the ground at the North and South Forks Confluence. The news stirred volunteers to action. Trees Atlanta and two dozen helpers replaced the three lost saplings with big, heavy plants, saving the 30 gallon giant beech for the very spot where the trees were lost. John Wiley enjoyed the company of a beautifully colored Muscovy Duck for a month, at his home on the South Fork near Clairmont Road. He reports the duck hung out with mallards and a blue heron, dining on wildlife and John's cheerios. South Fork Board Member Ruthie Taylor Norton is a Live-Work-Play fan, working in Atlanta's city office of sustainability, and playing with kayaks in whitewater everywhere in the Southeast. Last Saturday on the Chattooga she took a seven foot drop, hit a hole and broke her ankle. We're sending fruit and best wishes for a fast recovery. Posted on March 12, 2015 by Kimberly Estep. This time last year, we were dreaming of a U.S. Fish and Wildlife partnership. By the end of 2014, the partnership became reality when Deputy Refuge Chief Shaun Sanchez came together with Sally and Board Chairman Bob Kerr to sign a Memorandum of Agreement (MOA). We agreed to work together to engage urban communities in an effort to connect people with nature and protect and conserve the South Fork of Peachtree Creek. The regional Refuge program is underway! First on the list is a new Emory University Environmental Studies intern, Diane Ryu. Welcome to the fold Diane! A Cleveland Ohio native, Diane studied abroad in Namibia and Botswana, igniting a passion for conservation work. She worked with wild mountain gorillas in Rwanda and focused on environmental degradation. Welcome to Diane Ryu, our new intern! Diane's work with the South Fork will explore urban wildlife refuges. She'll be directed by colleagues from the US Fish and Wildlife Service plus the Greening Youth Foundation. We are beyond thrilled by this partnership and can hardly wait to see the fantastic impact it has on restoring the creek and building trails that bring us all a little closer to nature. I live just up the hill from the north fork of Peachtree Creek. In 2009, I stood on a nearby bridge looking down as the creek rushed past, spreading far outside its banks as trunks and trash came spilling downstream in a seething mass. Little did I know then that just a couple of miles downstream, houses on the creek’s floodplain were almost under water. As a river and coastal kayaker, I’m fascinated by rivers and their courses, navigability, health, and challenges. I’ve ranged throughout the Southeast on long kayaking trips in remote and not-so-remote areas. But I never thought about what happens to the creek in my own backyard on its journey to the Chattahoochee. My eyes were opened on a South Fork Conservancy tour this month, just after a massive rain event. As I watched the normally lazy creek flash by at 1900 cubic feet per second (a Class 2 creek), I began to fully understand how important it is to constantly battle erosion and effectively control storm water overflows via carefully engineered technique. Structures like the “upside-down bridge” on the Confluence Trail mitigate damage in major storms like this one. I was also intrigued by the archaeological sites so close to the river, the carefully planted stands of chestnut trees and indigenous plants, the signs of beavers at work and the birding opportunities that draw avid birders to the area. It was encouraging to meet neighbors and friends of the river out and about in the damp, exploring and telling stories about river-related events. Perhaps most importantly, I was happy to learn more about my “wild” neighborhood. A generous round of silent applause for my friends in the Atlanta Audubon Chapter. Generous because you shared your affection for our downy, rufous and nutty friends up and down the South Fork. Silent so we don't scare the birds. And Applause for all your tolerance for my wild binocular swings. My first ever bird count began in a misting sunrise at Zonolite Park January 3, 2015. Four robins waited for me on a wire above the Motorcar Studio next to the Soto Zen Center. Recognizing the first birds made me dangerously confident. By noon we had 39 different species of birds, many of them brown and small. My boots were muddy and I was chastened by how much I did NOT know. Favorite birds? Ellen Miller our leader spotted a brown creeper. She jumped up and down. It was a species first for Stella Wissner. Eric Bowles confirmed it circling a giant tree, like a barbershop pole twisting up the trunk. Except the tree is brown, the bird is brown and it creeps.Three of our best birders were celebrating. Teresa Mayes' favorite was the red-shouldered hawk. It flew out of the woods across the new meadow cleaned up from decades of asbestos contamination. American Crows heard the hawk and started protesting with loud caws. The pond held ten green Mallard Ducks, which joined the protest. The hawk sat like the king of all he surveyed and took the ruckus as applause.My favorite were a pair of Great Blue Herons. One flapped upstream toward Herbert Taylor Park. The other looked us over coolly and minced away. "The most dangerous animal out here," said Eric Bowles, as cool as the heron. No kidding? Fatal? "People trying to rescue an injured heron get a bill through their skull and die." A shiver ran through my binoculars. Yikes! The birds were here first. I'm the newcomer on the creek. Carol Bush liked the Kinglets, ruby and golden crowned. Big name, tiny bird, but lots of energy. Eric Bowles kept a wildlife tally of other species. "We ended the day with 7 deer – 5 at Zonolite and 2 at Cheshire Farm. We also saw a sleeping raccoon high in a dead tree on the Confluence Trail. The highlight for me was at the very end of the day on the Cheshire Farm Trail. Not 25 feet off I-85 at Lindbergh a red shouldered hawk was carrying and feeding on a pigeon – with the Cooper’s hawk that originally caught the pigeon nearby." Now let me ask all the Atlantans who drive on Lindbergh Drive every week. That's about a hundred thousand motorists. Do you know what's for supper on the Creek? Alos, a final question for the Audubon tally: If two hawks are eating a pigeon, does the pigeon count? Final tally for the Audubon Bird Count on the South Fork on January third: 43 species, 414 birds. Good Idea? Atlanta city hall wants ideas to make money for the city, using park and greenspace real estate as a possible source.Mayor Reed's office wonders if ideas like Citi Bike in New York, sponsored by CitiBank, would work in Atlanta. Maybe internet hotspots sponsored by an internet provider in exchange for a large sign on an internet tower? Park and greenspace backers and their volunteers are digesting the idea. Some see this as a great way to afford extra amenities for parks and greenspace users. Others are wary of commercializing precious green sanctuaries. What do you think? Last night, a remarkable and invested cross section of the South Fork Community gathered to help us figure out what 2015 will look like. Using 2014 as both an example and a lesson, these 14 neighbors, outdoor enthusiasts, and board members put their heads together to determine organizational priorities. They worked through four phases during the session starting with identifying priorities and ending with tasks that accomplish them. See the picture to the right? The group closest to us, composed of (from left to right) Anita Brown, Tom Tomaka, Chris Nelson, and Diane Ryu, worked so carefully and considerately that they were always the last group to finish an activity. Further down the table you see Sally Sears, Van Hall, and Christine Van Roosen having a lively discussion about the applicability of their ideas. Martha Porter Hall, Margaret Stewart, and Paul Looper sat at the end of the table fairly discussing each and every idea in front of them (see picture below). You won’t be able to see the folks deliberating from the comfy couches in the living room. Rich Sussman, Bob Scott, Barbara Baggerman, and Dave Kaufman’s discussions were full of jokes and laughter and they got the job done in comfort and style. So what did they decide? In first place, Outreach- get the word out so more people will volunteer and support this vision. 2nd Place, Trail Maintenance- keep those trails clean, open, and walkable. Third, continue working to restore native plants and eradicate invasive plants. Finally, capital improvements, like signs and bike racks, are highly desired along the trail. Now, we hand off not one, but 14 torches to these wonderful volunteers and work with them as they lead many of these events and outreach efforts, accomplishing tasks they themselves identified in the visioning session. We can see the path glowing brightly ahead. Can you? Posted on January 13, 2015 by Kimberly Estep. Saturday, January 3, 2015, the famous Christmas Bird Count of the Audubon Society for the first time will include South Fork Trails. The annual count braving cold weather to number birds and species in the name of science brings hundreds of binocular-toting bird lovers outdoors. For decades, bird counters ignored much of Intown Atlanta, under the theory there could be few interesting birds or numbers to count because of concrete and lack of green space. Two years ago, Atlanta Audubon president Joy Carter and others brought the CBC back within the perimeter. Her skill at encouraging volunteers with modest bird knowledge to join the fun re-invigorated the Society's annual count. Veteran naturalist Charles Seabrook interviewed Joy for a story in Saturday's Atlanta Journal-Constitution. "...last year’s intown CBC results — 84 species — showed that Atlanta, although buried under thousands of acres of asphalt and concrete, still has ample green space to provide habitats for a variety of birds. “We’re hoping, of course, for more species this year, and perhaps a surprise or two,” Carter said. In May 2014 Joy Carter toured South Fork trails with us and identified 25 species in just ninety minutes of walking. Why not come along in January and see how it compares to Joy’s May list? The week before Thanksgiving I was driving home when my cell phone rang. It was Ansley Abraham, sounding urgent. "Sally, somebody's been illegally dumping in the South Fork," he told me. By the time I spared Atlanta drivers my inattention by pulling over, he had emailed me photos of what he found. I opened up the files carefully. It was hard to believe my eyes. Big concrete slabs lay at awkward angles, slicing into the creek at Zonolite, on DeKalb County public land, across the beach from Zonolite Park. The pile of large pieces included fat chunks of broken concrete. "What in the world?" I asked him. Now I know Ansley Abraham is one great creek stewards, often walking miles up and down the banks in a single day after a rain. He's found some of the most beautiful pieces of native American pottery during his hikes, plus birds, unusual trees and rare human beings, too. But this human reminder is against the law. "How did anybody get the concrete there to dump it?" I wondered. Ansley said he saw fresh scars of bulldozer tracks, eating into the fragile bank, leading back into the flood plain by Johnson Road, toward Noble Drive and Meadowdale Avenue. Ansley Abraham ( In profile on the right) shared views on John and Teresa Mayes' terrific artifact collection. Also gathered are other creek collectors and SFC friends. Neighbors there support in large numbers the idea of connected trails leading from Zonolite Park to the two nearby city of Atlanta parks, Morningside and Herbert Taylor. I figured most would be outraged at someone using the creek as a dumping ground for concrete. Soon I emailed the photos to DeKalb County's Natural Resources champion David Butler. He was immediately alert, asking for every scrap of information we could provide. He promised to raise the red flag with state Department of Natural Resources water protection officers. The mystery deepened the following week. I walked the creek and saw an old South Fork Friend. He lives within a mile of the illegal dumping. I asked him to inspect the scars from the bulldozer. He did. It seemed to him the tracks lead to a back yard of one of the neighborhood houses. We passed that information on, too. Any one up or down the creek who can help identify the culprits? Please email David Butler at DAButler@dekalbcountyga.gov or Sally Sears at Sally@southforkconservancy.org. Bob Scott led his email with this last week. He didn’t need to say more- we understood. Bob the Beaver and Co. have returned to the Confluence Trail. A little background: We were introduced to a fine family of beavers last spring, when they announced their arrival by absconding with some of our hornbeam saplings. Now, we love the presence of wildlife, but we are not pleased at losing some precious hornbeams. We struck a compromise with the beavers: Trees Atlanta's Brian Williams taught us how to fence in our most important and expensive new trees & bushes. The non-natives? We left them up for grabs. After all, a beav’s gotta eat. By late fall, the return was a surprise. And trail users are keeping a close eye on beaver-istic activities on the trail. Last week they relayed surprising (and welcome) news: their new favorite snack seems to be the non-native, invasive Mimosa tree and even some Chinese Privet. Michael Montgomery's tireless energy tucked up twelve tires tossed illegally in the creek. Thanks Michael! Trash is a common topic of conversation in our office. I know, I know- you’re thinking, “Wow, I wish I could talk about trash all day.” True, it is one of those conversations that can just go on and on… and on…and on. Disposing of litter pulled out of the creek is a major challenge without a clear solution. Especially tires! What a tricky, tiresome topic. And we know we’re not alone- many of you have reached out to us with your own concerns about disposing of creek and trail litter. When our wonderful volunteers, huffing and puffing, drag tires up from the creek, they are often full of waterlogged dirt, making them heavy and difficult to move. Ideally, removing them from the creek would be the hard part. Well, we’re here to tell you what actually happens when a tire is pulled out of the creek. Here’s a recent example: volunteers pulled tires out of the creek and left them at the Lindbergh trail entrance. The ideal solution? Pick up by an organization equipped to manage tired removal We know others who have limited success with this approach, many by simply leaving the tires by the road. However, they sometimes end up waiting months for their removal. In the end, we went to one of our trusty volunteers, Michael Montgomery, who generously lent his morning and truck to the cause by going with us move a batch of 14 tires to Liberty Tire on Huber Street, where we paid $1.25 per tire to recycle them. While we are so grateful to Michael, we know that this a less than ideal solution to an endemic problem. The good news? More (and free) options are coming soon. Next month, in January 2015, a boon for tire draggers and battery hoarders alike will open its doors to the public. LiveThrive Atlanta’s Center for Hard To Recycle Materials (CHaRM) will accept a variety of items for recycling and even better, reuse- see the full list here. “We’re hoping to be open from 9AM to 4PM, six days a week,” says Peggy Whitlow Ratcliffe, who is leading the effort. “But it may end up being less than that- as non-profit, we’ll depend on volunteers.” The center can take up to 10 tires per person for free, anything more than has to stem from a city-approved clean up (authorization the South Fork and CHaRM can assist with). CHaRM’s first event is one day on January 3 9-4pm- holiday clean up. Why not go and recycle your holiday waste with at their new facility? At this particular event, they will be accepting old electronics, x-mas tree lights, styrofoam, plastic packaging, etc. Cars move in and out and around Atlanta on highways designed for speed and access to places I want to get to: to visit friends, go out to eat, drop off the dry-cleaning, attend a meeting or ball game, a concert or hangout at a coffee shop: a net works of streets roads and highways have become like well worn paths. I often refer to these comings and goings as “checking my traps”. New to the Atlanta area, I have found myself often musing, “I wonder were this leads to?” I wonder as I am out checking my traps, driving-the-now-all-too familiar-pattern of rights and left turns, what is under the ground where the MARTA station passes through…more networks and passages. I am so grateful for these questions…like the prospector…. digging around for a strike, a jewel; an undiscovered fortune. I admit, as well, to feeling sad and not just a little heart sick when I see buildings replacing green spaces. I feel connected to the natural world and miss being in it more deeply. Recently, while “checking my traps” on a bright, cold, and windy Saturday morning, I ran into the South Fork Conservancy tabling at ACE hardware – represented by a gal (Celia Lismore), the white table cloth flapping as if to lift itself from the table and head south. What caught my eye was a logo of a leaf and I wanted to see it up close… If you are reading this, perhaps you have also examined the logo. The leaf reminds me of the back of my hand and looking more closely, I see that the veins of the leaf represent a waterway and I am hooked by it. This is how I became acquainted with the conservancy their trail plans. I quickly signed up for the next dusk tour. I love a fall hike…I saw into the heart of the woods; and the creek, the rippling water sliding along. I saw what I can’t see when there is foliage or when I am driving 50 mph. When I raised my gaze to judge where I was, my surprise was the nearby buildings…impressive structures with their tall, unflinching backs turned to this serene spot down away and out of sight. They are on the leaf as well! Following the trail beneath the broad expanse I-85 was a delight I never expected. A blending of worlds of massive cement pillars and nearby flowing water and native species plants that made us all, well, happy to be in the middle of it. I saw small well-worn animal trails and a path leading to the creek made by a deer…they, too, check their traps every day, hang out at the stream for a drink…so much I saw and so much I couldn’t see…so much wondering…so wonderful. Posted on December 16, 2014 by Kimberly Estep. Bob and his wife Cindy immediately after the announcement sitting next to a very happy Sally Sears. We are thrilled Bob received the recognition he deserves and that we have received such a generous donation. One of the best parts about this is that it was really all thanks to you for your vote! And the winner is Bob Scott! A studio full of environmentalists cheered the South Fork hero as he took first place in the annual Cox Conserves Hero award Tuesday night at Channel 2 WSB TV. Scott and his wife Cynthia beamed at the huge $10,000 prize for his charity of choice... The South Fork Conservancy. "This is a great asset right in our backyard," Scott says of the Cedar Chase and Confluence trails he's faithfully mowed for years. The picture of Scott pushing a 22" mower caused Cox sponsors to suggest the prize include a riding mower one day. He recommends using the money to help expand the trail connections from the BeltLine to Emory University. Competition for the top prize included Joy Carter, whose work with the Audubon Society includes bird identification along South Fork Trails, and Barry Henson, testing and restoring north Georgia forest waters. The Cox Conserves Heroes program was created through a partnership between The Trust for Public Land and Cox Enterprises, the parent company of Channel 2 WSB-TV, to honor local conservation volunteers. I took clippers and a friend to help me with some Chestnut Guilt Sunday afternoon. A year ago I helped scouts and students plant 18 chestnut saplings on a slope by the South Fork, on the Confluence trail. All spring long I hiked the trail and watched the newcomer trees thrive. Proud Midwife! But the hot summer and fast-growing vines kept me from leaving the trail to check on the chestnut babies. Before long, I could not see them. By August my guilt was as hot as the sun, strangling like a honeysuckle vine. I ignored it. Only now, after a first freeze, was I ready to see how many survived their first summer of inattention. Jane came with me. We climbed to the top of the orchard, past a stray Bradford Pear, dodging thorny hybrid rose canes. There we found our first chestnut. Twelve months in the ground, small and the leaf was dead. But the pencil sized trunk was limber and alive. Jane pounced on the vines that overgrew it. I searched for another. A big one, maybe two feet high, full of chestnut colored leaves, stood in a charmed circle. We enlarged the circle. Another smaller tree up by the DOT fence was covered in broom sedge. Cleared! So we worked our way down the slope. My guilt eased with each yank of a honeysuckle root. I remembered the bright young man who led the project in fourth grade, at Morningside Elementary. Thomas Rudolph and his classmates put nuts in pots in a window and watched them spring to life. Special nuts with some immunity to Asian Chestnut Blight. Two dozen nuts survived the classrooms' experiment and Thomas visited them over the summer at Tony Powers' Hardware Store greenhouse. Then he led the planting of the 18 saplings which made it through the summer. WABE Radio did a news story on returning chestnuts to the South Fork. Then I sort of stopped paying attention. I know Thomas had a big first year in Middle School. It takes patience to raise an orchard, and hot work fighting invasive non-native vines. I'm not there yet. So finding a tree growing quietly under a tangle of vines was inspiring. Jane and I celebrated each little twig we found. Six. Seven. I chopped down the Bradford Pear. Beside it was Chestnut Eight. And then nine. There may be more, but that was enough for today. My guilt on hold, we scrambled down to the trail. Nine out of eighteen? I want to call Thomas and the boy scouts who helped to plant them. We are batting five hundred. I will take that. I bet they will, too. As GDOT’s best laid plans continue to unfold, the Cheshire Farm Trail has gone from gravel gorge to winding woodland, almost overnight! The trail reaped serious seasonal rewards this fall with extensive plantings along the footpath’s edge. Why not take a crisp stroll and try our tree scavenger hunt- which of these can you spot? While you’re at it, take a look at our completed prototype trailhead sign on the Meadow Trail (see Warner McConaughey’s article below). Parkwood Park replaced the lush green of summer with an abundance of fall colors! We are enjoying the bright yellow & crimson of the spice bushes and sweet shrubs. The red winterberries are especially abundant this year and I can see the birds eyeing the bright purple berries on our beauty berries. Installation for Meredith Judlicka’s, Garden Designer with Plants Creative Landscapes planting plan is due to begin in the south end of the park in the next few weeks. We are especially thankful for what is missing in our park—the war on the English ivy is almost won. The few remaining privet, amur honeysuckles, and liriope won’t be around this time next year. Parkwood Garden Club members continue to support the restoration with their generous donations so we can continue our efforts in 2015. Atlanta’s trail builders follow different approaches. The PATH Foundation builds bike trails, inviting users onto broad ribbons of concrete traversing the city and surrounding countryside. The Beltline’s vision centers around a train track and in-fill housing. The South Fork is different. Our goals aren’t focused on man-made infrastructure. Our paths follow existing sewer easements, highway right-of-ways, parks and residential backyards as they pass through first-growth forests, meadows, floodplains and urban settings. Through a network of 31 miles of trails, our vision aims for connectivity, restoration, and watershed repair. The trail’s design is unique in that it’ll be dictated by the wants and needs of the various neighborhoods through which it travels. Just as every neighborhood is unique with its own flair and appeal, each trail segment will reflect the local sentiment and personality. Some stretches will consist of a small footpath, others will be built for bikes and joggers, and perhaps others for wheelchairs and strollers. In a dynamic riparian environment, however, we need a unifying element to link all the different segments. Instead of infrastructure and concrete, South Fork trails will be unified by trailhead signage and wayfinding markers. The branding will represent the South Fork’s vision: it will help visitors feel connected, guides and informs them, and increases their safety and security. Developing the branding and signage of such a grand project has been a daunting and yet exciting process. We started by looking at signs at other parks, trails and historical sights. It was easy to see what we didn't want: obnoxious signs that stood out of place, and signs that were counterintuitive to their message. We also found that horizontal signs seemed to do more to hide the site than promote it, and did not blend in well to the natural setting. One cannot deny the strong links to the past and the many Indian influences along our creeks and trails--in fact the confluence of the North and South Forks is the site of an important Indian village. We also wanted to be respectful of our natural aesthetics, so our obvious choice for our signs were to make them out of natural materials--wood and rusted corten metal. Nature is better represented by vertical elements, so we looked at doing tall, subtle, vertical signs that would better blend into nature. By using a linear look, a bundle of sticks, almost like a totem pole, we think we have created a signature look that is representative of our mission. The South Fork is delighted to have installed its first prototype sign. Please come check out our sign on the Meadow Loop Trailhead at Lindbergh Drive and let us know what you think! Comments and suggestions are welcome! On Wednesday, October 29, 2014, bad news poured in from creek watchers. Atlanta Watershed spokeswoman Scheree Rawls confirmed that raw sewage poured into the South Fork of Peachtree Creek after a rain. Debris in the creek is the cause probable of the 5,500 gallon spill, from damage to a new sewer pipe near the CSX Railroad tracks just upstream from Taqueria Del Sol at Cheshire Bridge Road. Emergency crews worked quickly to repair the system, adding signs alerting nearby neighbors to the unsanitary conditions. Rawls says the city reported the spill to the Georgia office of Environmental Protection. The spill is near a large tank built to hold sewage during rainstorms. Atlanta is completing a court-ordered repair of its sewer system, and in June installed a ten million gallon tank to store raw sewage off Cheshire Bridge at Liddell Drive. The tank is designed to take pressure off two sewer lines on either side of the creek. Clearly, rainstorms are part of the problem. The Watershed Department's website says the Liddell Tank is intended to prevent spills during storms. The following was taken from the city’s website peachtree-creek-capacity-relief-project: "System capacity is sufficient to convey dry weather flows but is compromised when conveying peak flows generated during wet weather." Planting day was a blast! Photo of Dean Sprinkle, courtesy of Marianne Skeen. A couple of years ago, the entrance to Ira B Melton Park at Desmond Drive was so overgrown with privet that most people didn’t realize the place was there. Then, the South Fork Conservancy got the ball rolling; the neighbors got fired up and formed a Park Pride Friends group, and the Boy Scouts threw in many helping hands. And now? The privet’s gone. Same for a tangle of English ivy and Asian honeysuckle. Thanks to a Park Pride Small Change Grant, some generous matching funds (from the Clairmont Heights Civic Association, Medlock Area Neighborhood Association, South Fork Conservancy), wonderful planting layouts by Ainsley Waken of Awaken Landscape Designs, and a tremendous amount of hard work by the local community, Friends of Ira B Melton Park replaced the invasive species with thriving Georgia natives. This extensive planting project received some much appreciated cash and in-kind donations along the way from the following: M. Cary and Daughters, Tony Powers at Intown Ace Hardware, Sally Sears, Lola Halpin, Denise Hartline, and Ron Smith (all members of the Georgia Native Plant Society). The trail loop got some TLC, too. Thanks to Boy Scout Troop 534 and neighbors with strong backs and willing spirits, the south section near Glenn Creek was graveled. No more sinking ankle-deep in mud after a heavy rain! And Cub Scout Pack 6 of Den 7 Webelos II did a great job clearing out trash deposits in the park interior. Looking forward to 2015, DeKalb County’s Parks Department promises a stepping-stone crossing over the South Fork of Peachtree Creek. It will connect Ira B Melton and Mason Mill Parks with an innovative method of keeping feet dry and water flowing between large stepping stones. The idea is funded, projected for completion in September 2015. Posted on November 18, 2014 by Kimberly Estep. Click on the link below to get up close and person with our Fall printed newsletter! It's a good one so we hope you'll make a cup of coffee, put your feet up, and enjoy the read. Posted on November 5, 2014 by Kimberly Estep.